The pause is an exceedingly important feature in any kind of story, and a frequently recurring feature, too. It is a dainty thing, and delicate, and also uncertain and treacherous; for it must be exactly the right length - no more and no less - or it fails of its purpose and makes trouble. Howdy, and welcome to the Wright Right podcast! My name is Caitlin, and today we are going to discuss comma usage in restrictive and nonrestrictive clauses. The failure to correctly punctuate a relative clause is a common error that we see here at the Writing Center. The correct way to punctuate a relative clause depends on the role that the clause plays in the sentence. Before we address correct punctuation methods, we first need to define the two major types of relative clauses that can be found in a sentence. The first relative clause type is called a restrictive clause. Restrictive clauses are vital to the meaning of the sentence, particularly the subject that the clause is concerned with. The presence of absence of a restrictive clause changes (or restricts) what the sentence is trying to say. The garden gnome who loves to swim ran eagerly toward the pond. In this sentence, “who loves to swim” is a relative clause that defines the garden gnome. If this clause was absent and the sentence was taken out of context, we would have no idea the gnome to which the sentence is referring. Thus, this is a restrictive clause. The second type of relative clause is called a non-restrictive clause. Non-restrictive clauses provide what is considered extra information. Although this information may add more detail to the sentence, the presence or absence of the clause doesn’t change the sentence’s meaning. 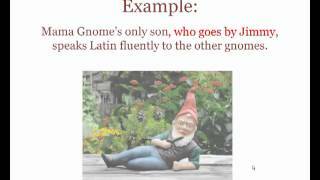 Mama Gnome’s only son, who goes by Jimmy, speaks Latin fluently to the other gnomes. Since Mama Gnome has only one son, specifying that the son’s name is Jimmy doesn’t change the meaning of the sentence. It simply provides the reader with extra information (in this case, Jimmy’s name). Now that we know the basic definitions of restrictive and nonrestrictive clauses, we can bring punctuation into the discussion. Fortunately, the rule is very simple: non-restrictive clauses are set off with commas, while restrictive clauses are not. It may seem like no big deal, but the way that the relative clause in a sentence is punctuated can change the meaning of the sentence. The two gnomes, sitting under the tree, discussed their favorite sunbathing spots. The two gnomes sitting under the tree discussed their favorite sunbathing spots. The first sentence indicates that there were only two gnomes, who happened to be talking about sunbathing while they sat under a tree. The second sentence indicates that out of all the gnomes in the location, the two sitting under the tree were talking about sunbathing. Before we end today’s podcast, let’s quickly review what we’ve learned. There are two major kinds of relative clauses. Restrictive clauses are very important to the meaning of the sentence. The clauses are not set off by commas because their presence is necessary to convey exactly what the author wants the sentence to say. Nonrestrictive clauses contain ‘extra’ information that does not affect a sentence’s meaning. These clauses are set off by commas, because their presence is not vital to the sentence. I hope that you have found this screencast helpful. Remember, if you have questions of concerns regarding any stage of the writing process, check out our other podcasts and online resources on our website. You can also come and see us at the Writing Center! We’d love to help you out!